Funded Personnel: 1 PhD (half-time) and 1 MSc (full-time) student. Nowadays, electric motors constitute more than 50% of the total electric consumption. Variable frequency drives (VFD) have become widespread in the industry. Moreover, electric vehicles are expected to be much more common in the next decade. Several control mechanisms which have been achieved via hydraulic systems are now being replaced by electromagnetic systems in the aerospace industry. In addition, sensitive servo drives are substituting for mechanical parts rapidly in the military defense industry. 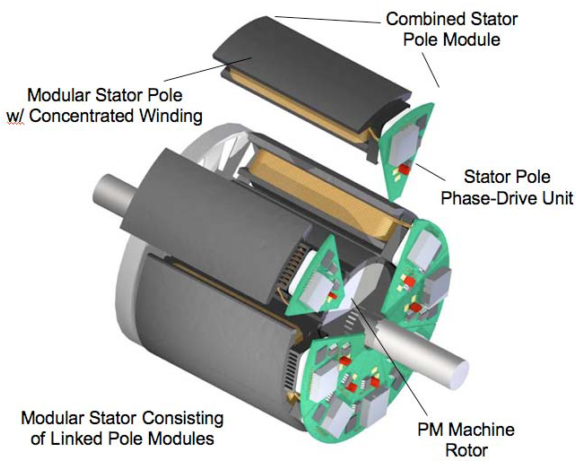 The electric motors are driven by separate drives from outside which are connected via long cables in all these applications. This leads to poor power density (W/kg, W/cm3) values. These applications also require high reliability, redundancy and drives with high fault tolerance. The motor and drive will be integrated into a single package which will lead to high power density values (5 kW/liter) which will be very important in electric traction, aerospace and defense industries. Both the motor and the drive will be composed of several modules operating in parallel so that the design and control will be more flexible, thermal management will be easier and redundancy of the system will increase. Fault tolerance is very important in mission critical systems (aerospace, defense etc.). A fault tolerant system may continue its operation under a faulty condition with reduced power rating. The motor drive system will be able to continue its operation in case one module is faulted thanks to the modularity of the system. In this project, new generation wide band gap (WBG) Gallium Nitride (GaN) power semiconductor devices will be utilized at high operating frequencies. By doing so, the volume of the motor drive is aimed to be reduced by 30% and the efficiency of the motor drive is aimed to be enhanced by 2% compared to the conventional drives. All the work within the context of this project are conducted in an open-source manner and can be accessed via https://github.com/mesutto/IMMD. Moreover, the project coordinator is a member of PowerLab research group the website of which is http://power.eee.metu.edu.tr/. A PhD student is currently working in the project and we are looking for a full-time MSc. scholarship student. 10 undergraduate students are a part of this project with several topics who are performing METU EEE STAR (http://star.eee.metu.edu.tr/current-program/) program and are also members of the sub-research group called Research League (http://power.eee.metu.edu.tr/research-league/).